The Sensory Design Lab (SDL) helps architects/designers understand the neurophysiological relationships that exist with the built environment. It is an adaptable and rapidly deployable structure that can be used as an experimental setting within a real-life environment, so we can test the impact of specific design variables against specific human outcomes. It is made of a lightweight, re-configurable framing system to create a 10’x10’x8’ testing space with interchangeable interior panels. Its first iteration was a modular stick-framing unit which could allow a room within a room to be constructed in less than two hours with rapid prototyping materials. We developed custom-made sensors to capture environmental light levels, temperature, humidity and sound levels. Additionally, we used biometric sensors including heart rate monitors and thermal cameras to capture human response. Study one: How do personalization of space and environmental quality impact student response? 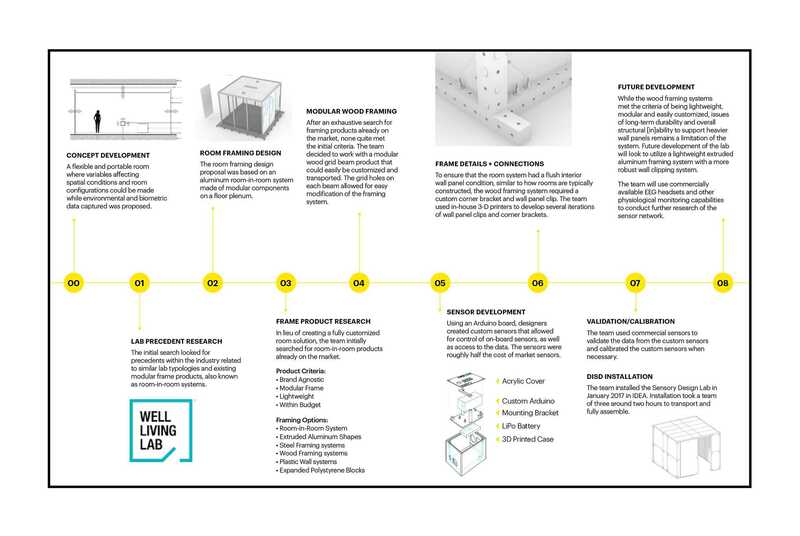 We conducted a pilot study to test the functionality and deploy the structure into a live space — in this case, a high school — to test how environmental variables, impact self-reported and physiological responses. Our study specifically focused on furniture selection, room layout, and environmental conditions including sound, illumination, temperature and humidity as independent variables. Human responses, such as behaviors, self-reported learning achievement, subjective anxiety levels, and heart rate were dependent variables. We installed the SDL within a high school that had recently implemented a personalized learning program. The Innovation Design Entrepreneurship Academy (IDEA), a charter high school within the Dallas Independent School District, was a new school that only had 9th and 10th grade students when this study took place in 2017. How can we create a rapidly-deployable space for environmental testing? Can we test relationships between environmental attributes and the response of high school students within a pop-up space? How do personalization of space and environmental quality impact student response? Students who could see outside the SDL reported higher achievement than those with limited or no visual access, yet some students indicated visual distractions could interfere with their learning. Larger groups personalized the space more than smaller groups, implying personalization may be desired more in collaborative settings. Fidgeting was most likely when baseline sound levels were lower. Fidgeting may help to relieve anxiety but may not help academic performance. Anxiety levels decreased during the 30-minute experiment; however, the reduction was smaller when sound levels were high. Higher anxiety levels at the beginning of the experiment were related to lower degrees of personalization. Students find comfort in a variety of positions, including leaning back while seated. They preferred chairs to stools, with stools being used as an additional surface for belongings. Visual connection to other areas can help learning but may distract students depending on the student and the context. Researchers recommend providing as much visual information as possible from a given spot to provide students choices to optimize their view. Sufficient space can support personalization, such as adjusting seating orientation and choosing a view. 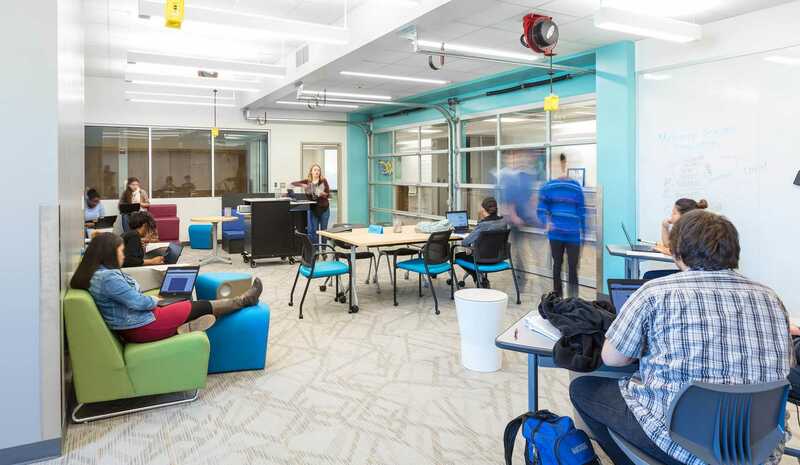 More options for personalization may be desired in larger spaces that can accommodate different sizes of groups and independently working students. Careful acoustic considerations are needed to control sound levels in school environments. Researchers recommend sound-absorbing materials. Some background noise such as white noise or sounds of nature may also be beneficial. Providing choices of moveable and ergonomic furniture can aid students’ personalization of their space by allowing for different body postures and uses. Casters not only allow students to move easily but also reduce associated noises. Storage space in the learning environment can reduce unnecessary trips to retrieve items, which can also reduce distractions to other students. The success of the pilot study shows the potential of systematically controlling light and temperature, finishes and colors, views and openings, proportions and many other features in future studies to assess the impact of interior design on human response. The SDL is currently set up within the 2,000-square-foot lab in HKS’ headquarters in Dallas. Phase two is underway with the architects and designers using the SDL to test their hypotheses with an expanded set of devices including VR/AR headsets, motion sensors/body tracking camera, electroencephalogram (EEG) and Galvanic Skin Resistance (GSR) sensors. Current and future use will further explore the relationship between the built environment and human neurophysiology. Advances in neuroscience could shift designing for the “human” to designing for the “human brain.” Our goal is to infuse experimentation into design culture and understand the specific variables that may drive new architectural opportunities. We hope to broaden the range of human experiences and create environments more conducive to human well-being- such as better patient health, office worker creativity, and student learning. HKS partnered with the Center for Advanced Design Research and Evaluation (CADRE) and Dallas Independent School District on this research. The pilot study was funded by an ASID Foundation Transform Grant, with additional support provided by Herman Miller and USG. Giyoung Park's research is bridging environmental design and social sciences. Her research focuses include social capital, environmental stress, mobile communication technologies and special populations, utilizing both quantitative and qualitative research methods. Fill out the form below to download the full report. You can withdraw your marketing consent at any time by sending an email to website@hksinc.com. Also you may unsubscribe from receiving marketing emails by clicking the unsubscribe link in each such email. More information on our processing can be found in the HKS Privacy Statement. By submitting this form, I acknowledge that I have read and understand the HKS Privacy Statement.